Whether it's one location or one hundred, Empire Paper and its partners have the size, technology and experience to service business customers with excellence - on time, every time, in any market. 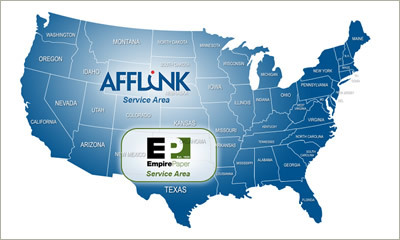 With Regional Distribution Centers servicing Texas, Oklahoma, New Mexico, Arkansas and Kansas, the Empire Paper Company truck fleet can service single unit as well as multi-unit chain accounts across a broad geographic area. Our commitment to information technology and operational excellence also allows us to service multi-unit business efficiently in many states outside of our current delivery route area. If the scope of your business is even larger, our affiliation with Tri-Link and AFFLINK offers you a value proposition that includes regional, national and international integration of your procurement process with our electronic commerce platform linking over 400 member-owned locations. Global reach, standardized products and processes with local service - that's our supply-solution program.